add a subtle sparkle with a lot or a few sequins! So today I have two card variations using a little and a lot of Doodlebug sequins. I think that my most favorite way to add sequins is to hand-stitch them. stitching sequins...plus it looks pretty too! add a pin back or piece of magnet so that it can be displayed in other ways. This next card goes with the less timely approach to adding sequins...mini adhesive dots! I've used the 3/16" High Tack Adhesive Dots by Xyron; a great size for sequins. I simply followed the dot design on the patterned paper in attaching the sequins. Doodlebug Products are from the Sugar Shoppe Collection and Lily White Sequins. 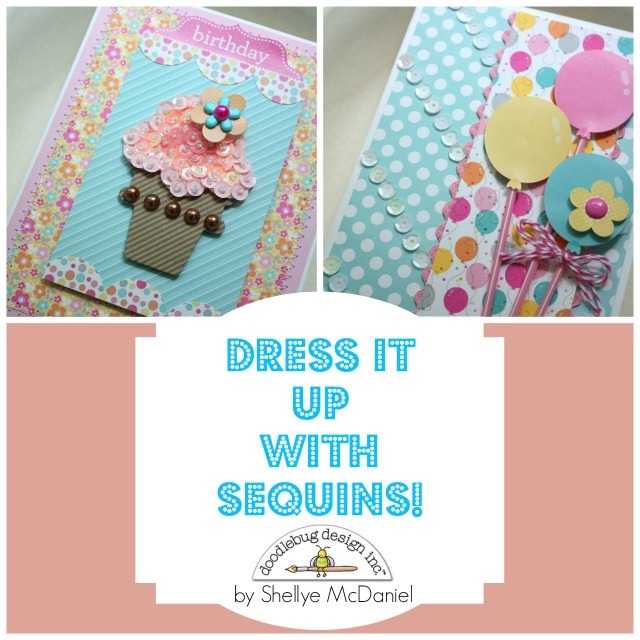 I hope that you find some fun ways to add Doodlebug Sequins to your projects too! These are gorgeous Shellye...I love that cupcake! What super, fabulous ideas Shellye has to share with us - I am so in love with Doodlebug's sequins and I just found more uses thanks to Shellye's awesome post!! Love the diagonal stripes highlighted with the white sequins!!! Just really excellent work here!! Super sweet card! I have to try the stamps and dies!!! Love doodlebug & love these designs! Beautiful work! DELIGHTFUL pair of cards Shellye!!! LOVE your balloon card too, so clever to align the sequins with the dotted paper!!! THANK YOU for sharing your SUPER SEQUIN INSPIRATION!! !